Mazor Robotic Spine Surgery is the industry-leading technology, representing the highest level of precision, safety, and recovery for minimally invasive and open spine surgical options. The Pre-Operative Analytics suite of tools uses revolutionary software to create a comprehensive and verifiable surgical plan as part of a total patient treatment strategy. This plan also offers the doctor the option of performing an entire simulated surgery exactly like the patients before he enters the operating room. Intra-Operative Guidance uses precision mechanics and a surgical robotic arm to guide the Mazor Robotic spine surgery tools and implants according to the Pre-Op Analytics surgical plan. 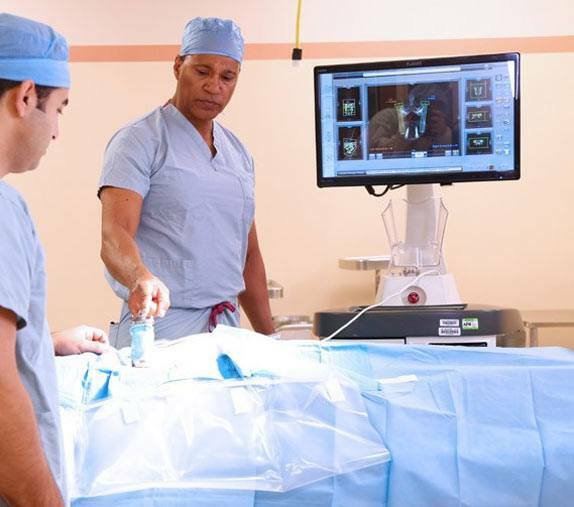 Coupled with innovative tracking and imaging, Intra-Operative Guidance verifies predictable execution to make sure the procedure is going to plan. The Mazor X™ system incorporates Intra-Operative verification tools. The surgical loop is closed, enabling comparison of the plan versus performance using intra-operative imaging tools and tracking technology. Through the use of ultra-modern imaging technology, which creates a computerized tomography scan (CT scan), Mazor Robotic spine surgery allows surgeons can pre-plan their patients spine to diagnose and pinpoint the health issue that needs to be addressed with increased accuracy, reduced complication rates, and limited poking, prodding and unnecessary tissue and muscle damage that generally takes place throughout the course of traditional surgery. Dr. Moazzaz will answer any questions you have about the Mazor X™ to make sure you are familiar with its capabilities for your specific procedure. The following are links we have found helpful in referring our patients to sources for additional information about spine conditions and surgery.